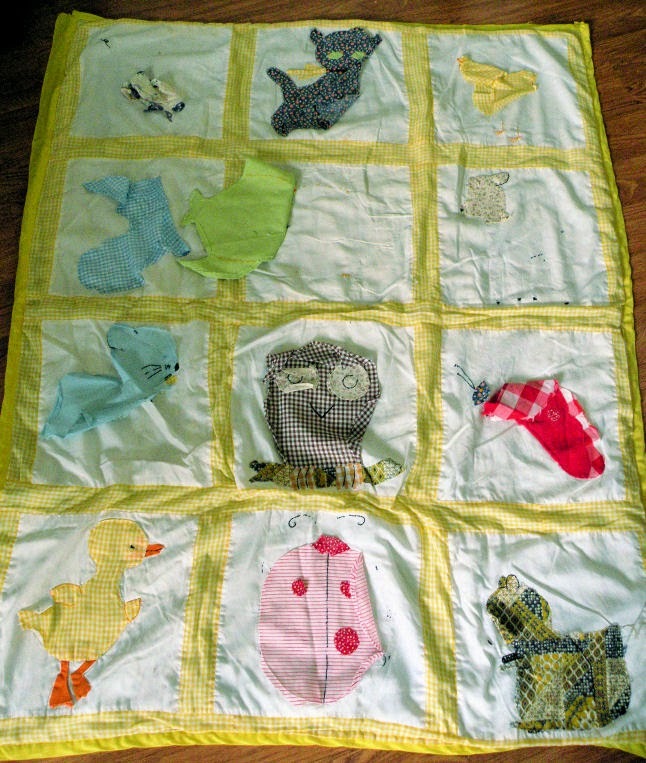 The biggest item on my mending list for the week is a quilt my grandma made me almost 30 years ago. I am her first grandchild and I think it'll be very nice to repair it and give it to my son, her ninth great-grandchild, especially since it's nicely gender neutral (unlike many of the other items I've saved from my childhood). I think I have all the pieces. It has been repaired in the past, by machine. But even those stitches are coming out now, so I decided to do it by hand this time. The cat should be completed by the time I go to bed tonight. I also have a few buttons to sew on, two pairs of my own jeans to patch (or cut off for shorts), and a few small rips and tears to stitch shut. Thanks for emailing the photo. It's a beautiful quilt, even more so because of the love put into it. I wish you the best on mending it. Are you planning to actually quilt it too? Since I'm re-sewing the appliques to the already assembled quilt, I'm sewing through all layers and effectively "quilting" it as I go. I may add a few more bits of quilting when I'm finished to even things out (for the squares that don't require quite as much mending).